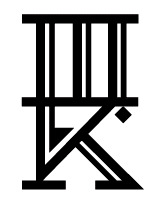 As we wind up the Tattooed Poets Project on this, the home stretch of April, we are double-posting to accommodate the record number of submissions we received this year. Our second tattooed poet of the day is Julie Kantor. "It was a very early morning in Portland, OR. I picked up my best friend, Jess, to get breakfast. On the way to the cafe, we saw two guys, each had a shopping cart packed to the brim. They were laughing with each other, smiling these huge smiles. Jess turned to me and said, 'If we were bums, we would still be best friends. Bum friends.' 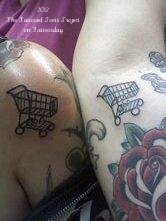 I suggested, strongly, that we get matching shopping cart tattoos. After breakfast we found this small tattoo shop with no name off Glisan that just opened. 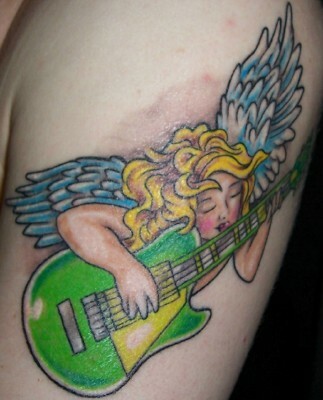 Inside, we made a deal with the shop's very green apprentice to do both tattoos for $40. The 'bf' in the tattoos stands for bum friends." sustain w/just us then we shouldn’t have to begin with. Julie Kantor just completed her first manuscript, the currently unpublished, The Beautiful West. She is a M.F.A. candidate in poetry at Columbia University where she teaches in the Undergraduate Writing Program. She is also a musician and plays in the new band, Cycles. She lives in Brooklyn, NY. Thanks to Julie for sharing her poem and tattoo with us here on Tattoosday!